This safari is a perfect combination of mammal and bird watching combining the adrenalin rush of searching by speedboat for the elusive Jaguar whilst taking in the sight and songs of a fabulous selection of exotic birds including Hyacinth macaws, golden-collared macaw, Mato Grosso antbird, white-lored spinetail, fawn-breasted wren, jabiru, large-billed antwren, helmeted manakin, great rufous woodcreeper, plumbeous ibis, rufous casiornis, long-tailed ground-dove, pale-crested woodpecker, Ringed Kingfisher, and Amazon Kingfisher. 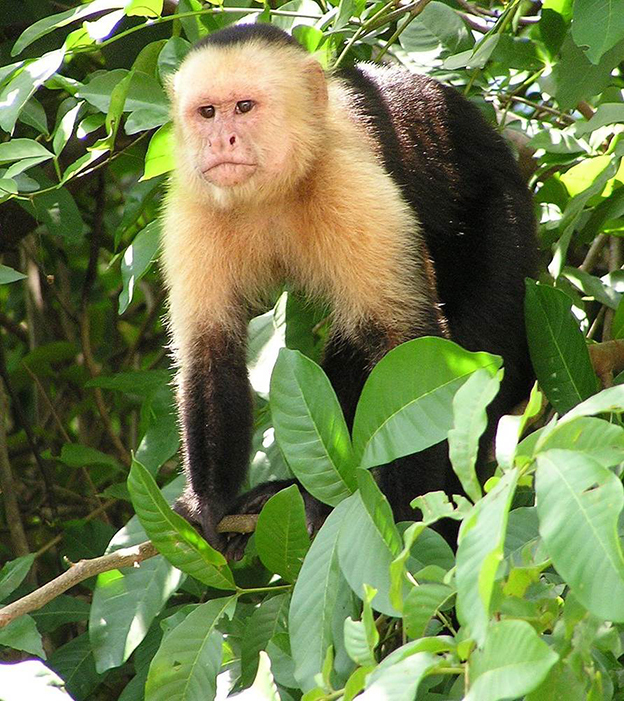 This Safari takes you in comfort to the wildest places to marvel at the most spectacular wildlife of South America. Jaguars in the Pantanal weigh up to 350 pounds (150 kilos), while the same species in the Amazon or Central America reaches only 160 pounds (73 kilos). 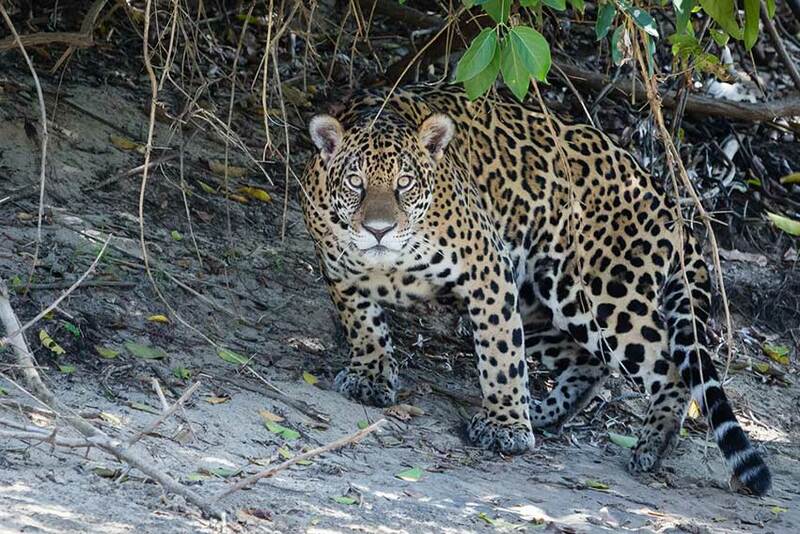 Normally almost impossible to see in Belize or Amazon, at our site in north-central Pantanal, a "Jaguar Miracle" has occurred. Since 2000, strict protection from hunting and abundant Caimans and Capybaras on the riverbanks have made Jaguars uniquely easy to see on 95% of the days in the low water season, often for several hours per day. Jaguars have been shown to guests more than 3,500 times since we first guaranteed Jaguar viewing in 2006. Start the tour by arriving at the Cuiabá airport, where we will be waiting for you and take you to lunch at the Quintal Buffet Restaurant. The group leaves by 2.30 PM at the latest even if there are flight delays. A transfer will take you to the SouthWild Pantanal lodge at the Fazenda Santa Tereza. Stops along the Transpantaneira road are timed to allow you to reach SouthWild Pantanal lodge no later than 7 pm dinnertime. On day 2, you’ll have to wake up early, but will enjoy the trip in the Safari Truck to Porto Jofre. Stops along the Transpantaneira are timed so that the group can reach Porto Jofre by 10 am to take maneuverable search boats upstream into heart of Jaguar Zone to Jaguar Flotel. Overnight SouthWild Jaguar Flotel. 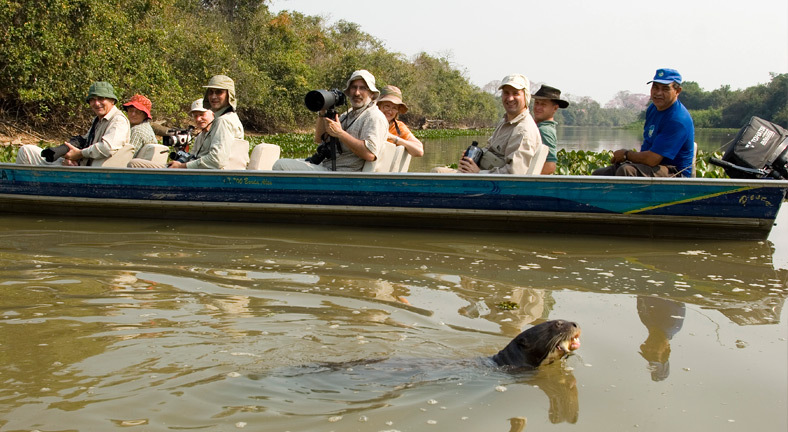 Every day, you will have enough time, about 8 h, to observe Jaguars and Giant Otters on some or all of the following rivers: Tres Irmãos, Cuiabá and Piquirí. On day 6, early breakfast, check out, brief morning boat search, then land transfer back to SouthWild Pantanal in open Safari Truck. Truck has sun/rain roof and comfy bucket seats (unique in Pantanal). Early morning departure to the Cuiabá airport. · English speaking guide throughout the entire trip, equipped with a customized SouthWild iPad specially loaded with scientific lectures, photoguide, Google Earth maps and other features. 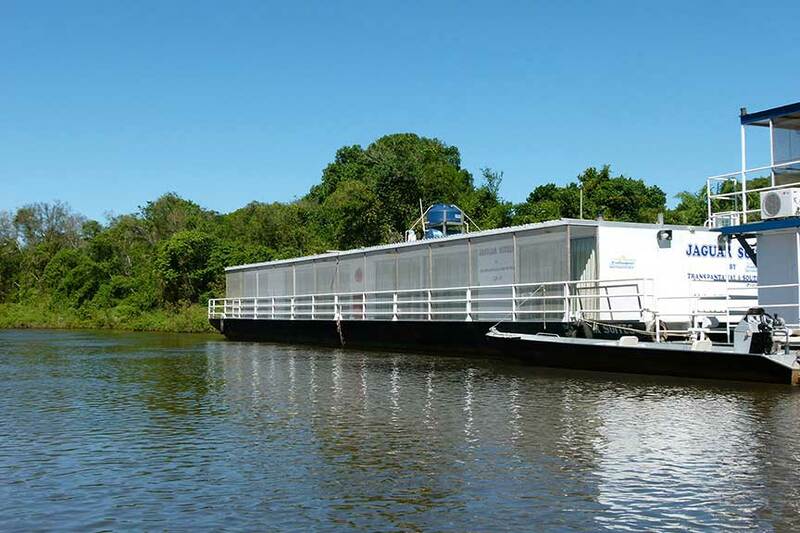 · Comfortable, air-conditioned transport between Cuiabá and SouthWild Lodge Pantanal. · Open Safari Truck for transfers between SouthWild Lodge Pantanal and Porto Jofre. · Eight hours per day of Jaguar searches and observation in a maneuverable, radio-equipped motorboat. · Three radio-equipped boats on the rivers speciacfilly searching for Jaguars for at least 8 hours per day. · The lend of a SouthWild Lodge duffel to each guest in order to reduce the amounts of clothes and gear in the flotel. The main suitcases remain safely stored at SouthWild Lodge Pantanal. 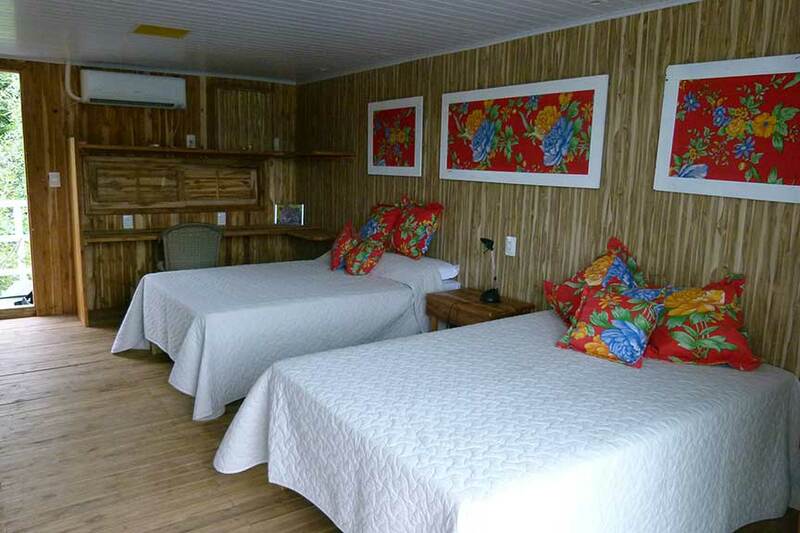 · Free WiFi internet at SouthWild Lodge Pantanal. · Unlimited drinking water from water coolers at SouthWild Lodge Pantanal and SWJF. · International and domestic airtickets. NOTES: Please schedule an early morning flight to reach Cuiabá. The group will leave no later than 2.30 pm from Cuiabá. If your flight is delayed, you will have to pay for private transport to SWP, as it is not fair for late flights to reduce the Pantanal time of on-time guests. The return from SWP to Cuiabá is around 6.30 am, which is ideal for flights leaving Cuiabá at or after 11:00 am. Guests with later flights are welcome to relax in the air-conditioned SouthWild offices once and use free WIFI. The office is only a 6-min walk or 3-min drive from the airport.